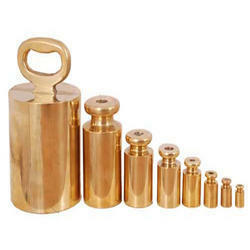 Leading Exporter of brass bullion weight, brass cylindrical flat weights, brass cylindrical knob weight, brass flat cylindrical weights, brass knob type weights and brass measuring weights from New Delhi. 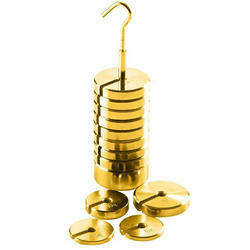 Being a leader in this industry, we are devoted towards providing a premium quality array of Brass Bullion Weights. We are acknowledged in the industry for manufacturing and supplying a quality approved the range of Brass Cylindrical Flat Weights. 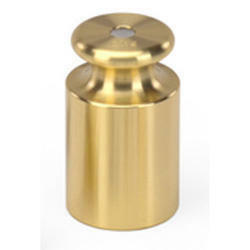 We are counted amongst the reckoned names in the industry, offering an exceptional range of Brass Bullion Knob Type Weight that are acclaimed for sturdiness and high strength. We offer them in different specifications and are used in different industrial applications. 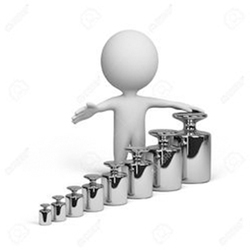 Clients can avail them in different grades and have high strength. Our entire product range is durable and functionally advanced in nature. The weights from 20g through 10g have cavity on the top. Precision Weights are Stable and are Conventional in structure. The weights 1g and above are Flat. 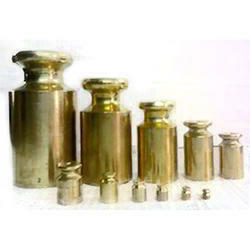 We are consistent in offering our industrial patrons this exclusive range of Brass Flat Cylindrical Weights. 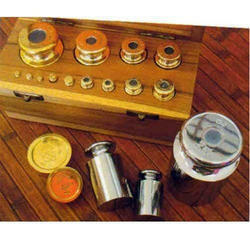 This precision engineered the range of weighing instruments called brass bullion weigh has been in wide demand for its quality features and reliability. Our offered range is in compliance with the industry standard of quality and is acclaimed by all our clients for its accurate weighing. 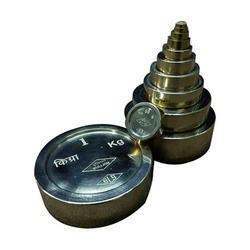 Customers can avail from us a wide range of weights and scales and in this range, we are offering Brass Knob Type Weights. These weights have been in wide demand for its major features. In this range, the weights 1g to 10g are of one-piece construction and can be adjusted during manufacture as per the requirement of the customers. 20g through 10kg weights have an adjusting cavity on the top sealed with a lead plug, while the weights 1g and above are perfectly flat on top to stack easily on center. 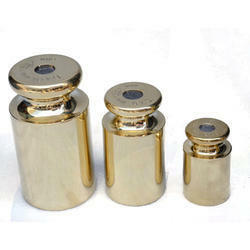 Brass Measuring Weights offered comprise weights coming accuracy tested for reliable usage. Backed by a rich industry experience, we are offering our clients a wide assortment of Brass Single Weight that is fabricated using finest quality raw material. This makes it even more accurate and suitable for sensitive scales. 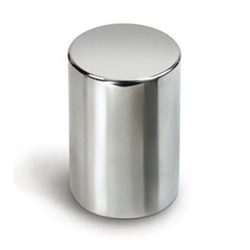 All mass standard are manufactured from the finest stainless steel, brass, and aluminum available, that has low magnetic permeability, uniform consistency and high resistance to corrosion. 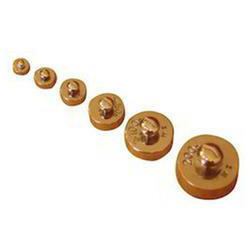 Brass Weights offered is available in density of 7.96kg/dm3 and magnetic susceptibility of <0.005. 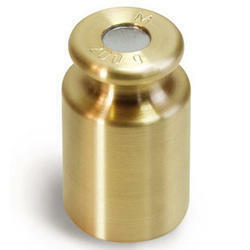 We are offering Slotted Brass Weights with best class & accuracy. Being one of the famous traders and suppliers, we are engaged in presenting Brass Slotted Mass that available in flat cylindrical shape with slot. Best quality brass, stainless steel and mild steel are used for the manufacture of these weights at our vendor’s location. Owing to the sturdy construction, excellent corrosion resistance and accuracy, these are massively popular in the industry. 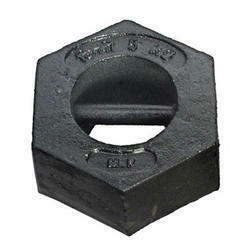 We have highly acknowledged organization engaged in presenting a remarkable range of Cast Iron Counter Weight. We offer the best quality Cast Iron Weights full range from 20 kg to 1 Ton capacity In addition to this; client can get the provided products from us at very economical prices. With firm commitment to quality, we are manufacturing and supplying a comprehensive range of Cast Iron Standard Weight Sets. 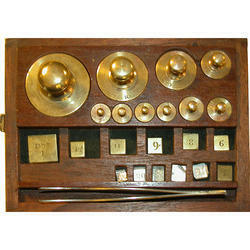 This range of standard weight sets is highly admired by the patrons for its educational use, general laboratory, industrial, commercial, technical and allied. The R-52 edition of these products are recommended by OIML for simple usage in commercial and trade practices. Available in different weights (50 g, 100 g, 200 g, 500 g, 1 kg, 2 kg, 5 kg, 10 kg, 20 kg and 50 kg) as per the demands of the clients, this range is stacked conventionally and re-verified or re-adjusted periodically. OIML recommended the above vide R-52 Edition 2004(E), for normal use in Trade and Commerce, Cast Iron Hexagonal Standard Weights from 50 g, 100 g, 200 g, 500 g, 1 kg, 2 kg, 5 kg, 10 kg, 20 kg and 50 kg. These can be stacked conventionally and re-verified or re-adjusted periodically. 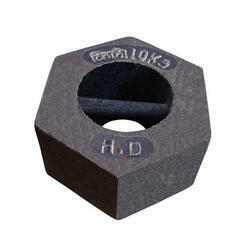 We supply Cast Iron Weights from 100 g up to 1000 Kg. It is largely demanded for the Calibration of Weigh Bridges and heavy duty Weighing Scales. No Calibration Certificate from NABL/RRSL Lab is provided along with these weights by default. They come in M1, M2 and M3 Class. These Weights are in great demand in Saudi Arabia and Indian Market. They are also known as more popularly as MS Weights. Hexagonal Shape for 100 g upto 5 Kg. Hexagonal Shape with Handle for 10 Kg, 20 Kg and 50 Kg Weight. For our weights, we source only the finest quality steel which offers the highest resistance to corrosion over the course of a weight’s lifetime. Our unique manufacturing process involves melting the steel under vacuum, polishing it using traditional mechanical methods, performing an electrolytic final-stage polishing, cleaning it in a fully automated process and the calibrating it using state-of-the-art mass comparators. This process has been perfected over years of experience to bring you accurate weights of the highest quality with a stability that remains unmatched in the market. Capacity – 500 Kg. 1000 Kg. Certified by weights & measures dept. Used for calibration of weigh-bridge. 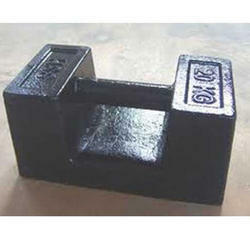 Cast Iron Heavy Capacity weights are available in sizes ranging from 100 Kg. to 2000 Kg. in OIML class M1 with ISO 17025(NABL) Accredited Calibration Certificates. Weights are manufactured from high-quality cast iron that meets specifications for hardness and mild steel casing. Castings are free of cracks, pits, and sharp edges and meet surface roughness requirements. Each weight has an adjusting cavity located on its side. Heavy Capacity Test Weights have the stacking facility with Hook for easy lifting through lifting devices like crane or forklifts. Heavy Capacity Test Weights are used for the calibration of EOT Cranes, Weigh-Bridges and High Capacity Weighing pads / weighing balances. 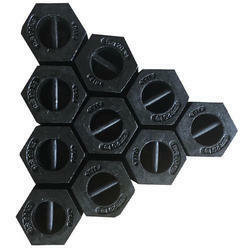 Cast Iron Hexagonal Weights are available in sizes ranging from 50 g through 50 kg and are available in OIML Class M1. Weights are manufactured from high-quality iron that meets specifications for hardness. Castings are free of cracks, pits, and sharp edges and meet surface roughness requirements. Weights are duly black painted and have adjustment cavities. Certification: Calibration certificate with NABL/RRSL/State Legal Metrology for M1, M2 class rectangular weights. 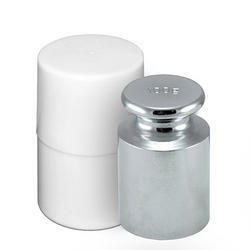 Weights are designed in rectangular shape with a handle to provide easy stack ability. Each weight has an adjusting cavity located in its handle. Weights confirm to OIML -111. 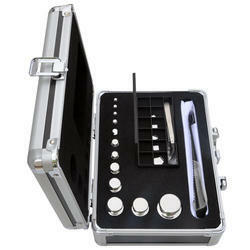 Application: Mostly used in calibration of high capacity balances. Casing is provided at an additional cost. Packaging Details: Packed in high quality polished wooden boxes at an additional cost. 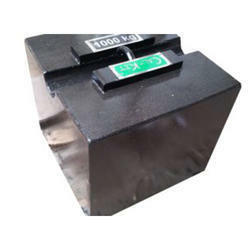 Cast Iron Rectangular weights ranging from 5 kg to 20 kg made up of high quality cast iron material. Available in OIML M1 accuracy class with ISO 17025 (NABL) accredited certificate. Accredited Laboratory Weights offered meet/exceed ASTM specifications. Analytical Balance Weight has helped us to achieve a very high level of trust in the market. 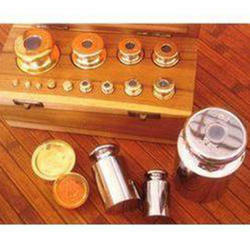 This one is provided by using superior quality stainless steel. 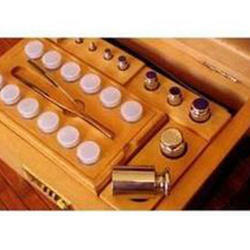 In this calibration weight box various measuring weights are packed in polished teak wood or plastic box. 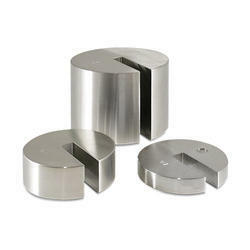 Our calibration weight box is fabricated in different sizes and shapes. Furthermore, this wooden box is made available with forceps and gloves. Analytical weights are manufactured from the finest materials including Austenitic Stainless Steel and are manufactured in sizes ranging from 1 g to 500 g. Weights are available in OIML E1, E2, F1, F2, M1, M2 and M3 accuracy class. Weights are designed so the specifications on surface finish, markings, construction, material density, and magnetic properties become more restrictive as the weight tolerances decrease in order to enable the weight to maintain its tolerance over time. These weights are designed for your most demanding weighing applications. Weights are used for the calibration of Ultra Micro, Micro and Semi Micro and Analytical weighing balances. Suggested markets for precision weights include, but are not limited to, pharmaceutical, forensic & nuclear industries. Available in the Sets and also Single Weights as per customer requirements. All Weights made from Austenitic Stainless Steel. 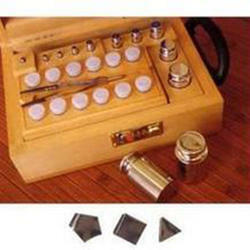 Analytical Weights includes Weights from 1 g upto 20 Kg. Available for E1, E2, F1, F2 and M1 Class. Calibrated from NABL Accredited Lab having ISO 17025:2005 Accreditation. RRSL Calibration Facility Also Available for selected Class. Calibration Certificates and the Laboratories are Internationally Valid and Acceptable. All Weights according to OIML - R111 Standards. 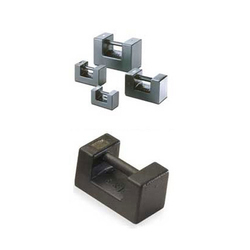 Weights Available in monoblock and also with an Adjustment Cavity. 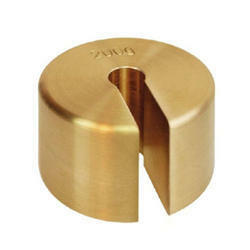 Cylindrical Knob Type Available for 1 g to 20 Kg Weights. Calibrated Weight offered feature construction with cavity for adjustment. Calibration Weight offered can be made available as per hierarchy of E1, E2, F1 F2, M1 and others. We can custom make precisely the weight for your application. Available in any size, denomination, tolerance, material, and shape. 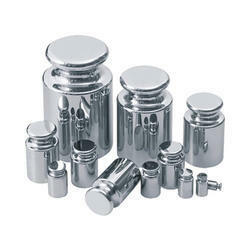 We are supplier/manufacturer of Fractional Weights suitable to industry needs. Available in the Sets of 12 Nos. and Single Weights as per customer requirements. Fractional Weight Box includes Weights from 1 mg up to 500 mg.
Wire Form Available for E1, E2 and F1 Class. Triangle Shape for 1 mg, 10 mg and 100 mg Weight. Square Shape for 2 mg, 20 mg and 200 mg Weight. Pentagon Shape for 5 mg, 50 mg and 500 mg Weight. Weights are used in a variety of applications such as pressure, torque, and tensile strength testing. 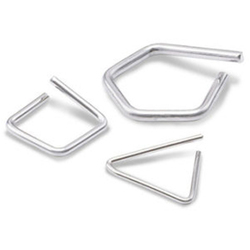 Hook weights are available as hook top only, hook top and bottom, or loose hook top and bottom. Hook top only weights are flat on top with a stationary hook in the center of the weight. Hook top and bottom weights have a flat top and bottom with a stationary hook on either end of the weight. Loose hook top and bottom weights have a flat top with a recessed bottom which allows the hook to move freely through the weight. The recessed bottom also allows the weight to sit flat on an even surface. We feel proud be single manufacturing laboratory/calibration weight in all accuracy classes in India as per OIML R-111 guidelines in all accuracy class E1, E2, F1, F2, M1 & M2 in brass & stainless steel. Our accuracy of Laboratory weight/test weight/calibration weight/ precision weight is highest among private laboratories in India & 2nd overall after National Physical Laboratory, New Delhi. 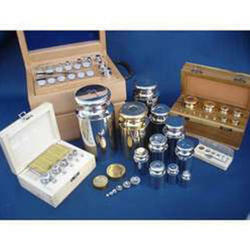 Weigh India offers world-class combination of precision, accuracy and value. Our Precision Weights, Laboratory Weights, Test weights, Calibration Weights are complying with IS/ISO/IEC 1705: 2005. Laboratory weights are manufactured from the finest materials including Austenitic Stainless Steel and are manufactured in sizes ranging from 1 kg to 50 kg. Weights are available in OIML E1, E2, F1, F2 and M1 accuracy class. Weights are designed so the specifications on surface finish, markings, construction, material density, and magnetic properties become more restrictive as the weight tolerances decrease in order to enable the weight to maintain its tolerance over time. These weights are designed for your most demanding weighing applications. Suggested markets for precision weights include, but are not limited to pharmaceutical, forensic & nuclear industries. 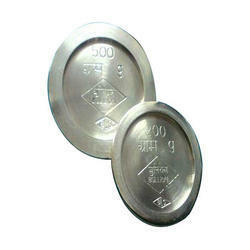 Measuring Weights offered is available with nominal value of 1mg-20kg. It is necessary for dealing and certification to commute conventional kilogram unit into Newton unit, the international common unit. We manufacture and export E1 Class laboratory weights that are widely used in pharma and chemical industries. 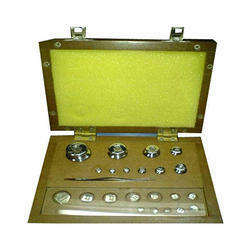 We provide these in individual or set of weights packed in polished wooden box lined with velvet cloth and provided with forceps and gloves. Handling of these weights with naked hands and marking on weights is prohibited. Our Precision Weights are manufactured from the finest materials including austenitic stainless steel and high grade stainless steel. Precision weights are available in sizes ranging from 1 mg to 500 mg. Weights are offered in OIML E1, E2, F1, F2 and M1 accuracy classes and are available in Wire Shape and Leaf / Flat / Sheet shape with ISO/IEC 17025 Accredited (NABL) Calibration Certificate. Weights are designed, so the specifications on surface finish, markings, construction, material density, and magnetic properties become more restrictive as the weight tolerances decrease in order to enable the weight to maintain its tolerance over time. 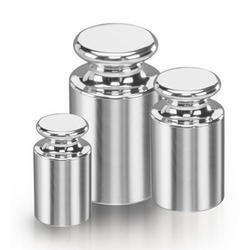 These weights are manufactured for your most demanding and accurate weighing applications. 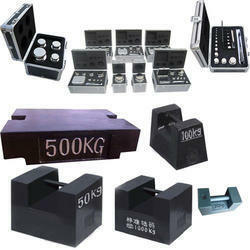 Weights are used for the calibration of Ultra Micro, Micro and Semi Micro weighing balances. 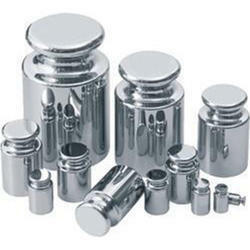 We are offering Stainless Steel Weights in all capacities & class as per industry demand. F2 Class weights manufactured by us is in high demand in the chemical and allied industries. 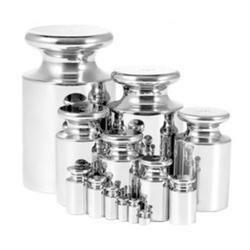 These quality weights are acknowledged for their smooth finish and dimensional accuracy. Our range of BO- WI for M1 (Stainless Steel) is calibrated in a climate-controlled environment and is manufactured using precision machining facility. These are available in various measuring weights and are packed in plastic box or polished teak wood box. 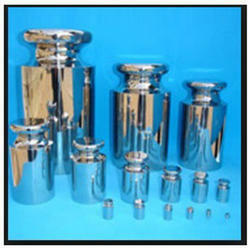 SSS is one of the prime suppliers for Standard Test Weights in India. We are probably the one of the few companies in India who are engaged in supply of all kinds of S.S. Weights viz; Calibration Weights, Analytical Weights, Laboratory Weights, Standard Weight Boxes, Brass Weights, Testing Weights and Cast Iron Weights. 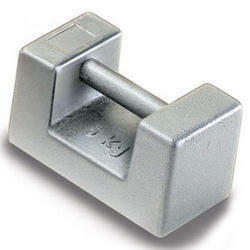 We can supply weights in all Classes that is E1, E2, F1, F2 and M1 Class. 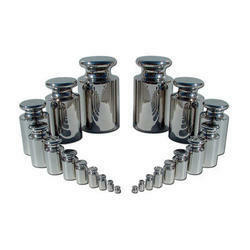 Stainless Steel High Accuracy Weights As per OIML Standard Used To Calibrate Any Type Of Analytical Balance. Available In All Capacities & Class. For Industrial & Laboratory Application. 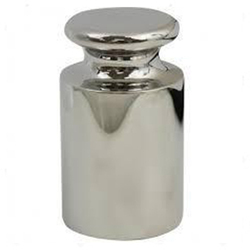 Laboratory Measuring Weights offered is made available in stainless steel finish. Packaging Details: Packaging: well packed in polished wooden box with separate section for each weight , lined with velvet. Each box includes forceps and gloves for better handling of the weights. 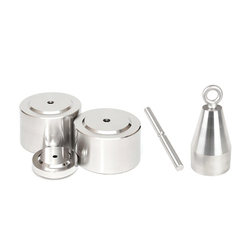 Calibration weight sets ranging from 1 mg – 500 mg to 1 mg – 20 kg in the combination of wire shape milligram weights with integral cylindrical knob shape gram or kilogram weights. Available in OIML E1, E2, F1, F2 and M1 accuracy class. 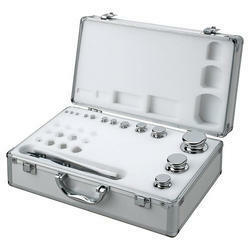 Chemistry Weight Box offered comprise highly accurate 304 grade stainless steel calibration weights. We are Leading Manufacturer and Supplier of E2 Class Weights in Delhi, india. * High precision meteorological standard weights and weight box. * M1, E1, E2, F1, F2, Class weights. Standard Laboratory, NPL (National Physical Laboratory). 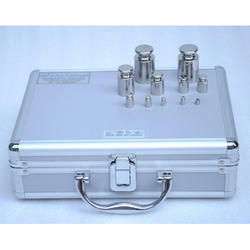 Laboratory Analytical Weight Box offered comprises highly accurate 304 grade stainless steel calibration weights. Manufactured and fabricated in full compliance with the standards of the industry, the offered range of SS Weight Box. 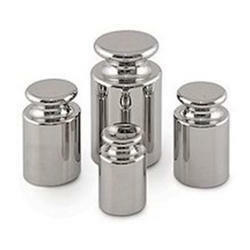 These weights are availed to the customers in a wide variety of weight specifications. We have fabricated this whole range in various mediums such as stainless steel, brass, and aluminum. Packaged in sophisticated cases, these are also availed to the customers in various comprehensive prices. Class: E1, E2, F1 & F2. Available in the Sets of 23 Nos. and also Single Weights as per customer requirements. Customized sets also Available on request. 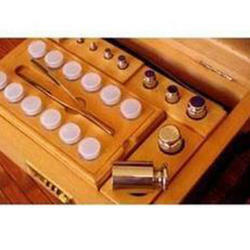 Standard Weight Box includes Weight Sets from 1 mg o 200 g (23 Nos. Set). Wire Form Available for E1, E2 and F1 Class for Fractional Weights. 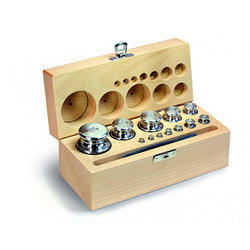 We are offering Wooden Calibration Weights Box. 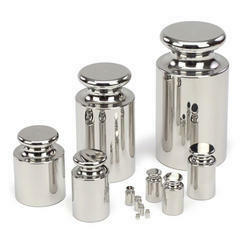 These calibration weights are made of quality stainless steel given the most accurate and industrial standard mass and composition along with a conventional and stable structure. We are availing this range to the customers in the most comprehensive and industry leading prices. 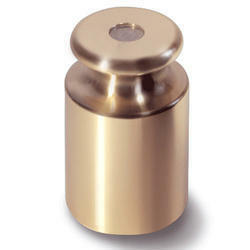 We are offering Calibration Weights of High Accuracy with NABL Certificates. We are offering Calibration Weights to our client. The intended purpose of the high precision weights of classes E1, E2, F1 and F2 as adjustment, testing and calibration instruments for scales of class II and for quality assurance in accordance with scales with fewer than 300,000 steps. This range is developed in accuracy class of OIML R 111-1 Edition 2004(E): F1 and is available in different capacities (1 mg to 20 kg) as per the demands of clients. Presentation: Weights Sets are supplied in Fine Polished Steam Beach Handmade Strong Wooden Cases lined with velvet along with the matching accessories like forceps for lifting the fractional and smaller weights, brushes and Piece of Chamois Leather for cleaning the weights, gloves for not to touch weights with naked hands. 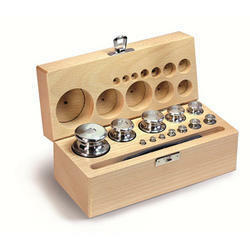 Individual Weights are supplied in Fine Polished Steam Beach Handmade Strong Wooden Cases lined with velvet. We manufacture ER-WI (flat cylindrical) medium accuracy weights that are widely used by jewelers for their accurate measurement. These are designed using quality raw material in line with international quality standards. Economical weights for general laboratory, industrial, commercial, technical and educational use. Typically fabricated from cast iron ,stainless steel, Brass. These are also known as commercial weights. 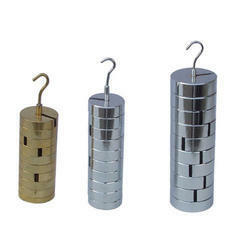 Consists of rectangular weights, cylindrical knob type weights, slotted weights, hanger weights, cylindrical with handle weights. Packaging Details: We provide wooden boxes for individual weights at an additional cost. 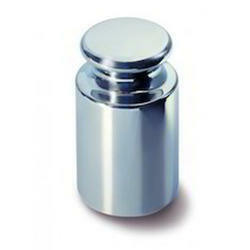 We are offering High Quality industry standard SS Slotted Weights. 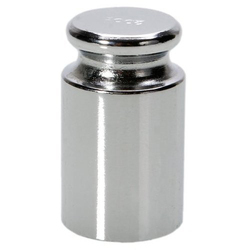 We are offering Cylindrical Test Weight with High Accuracy for laboratory use..
Our company has been widely acclaimed for providing our clients with this extensive range of SS F1 Class Weight. 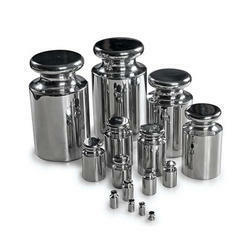 These weights are used in a wide variety of applications for the meticulous weighing of products. Having various usages, these can be used at distinct places such as laboratories, shops, even industries. Customers have availed this range in the most comprehensive prices. We are the reputed supplier and manufacturer of superior quality SS M1 Class Weights. These are availed by the customers in various sizes and masses and are made out of best quality raw metal with a high-grade finish. 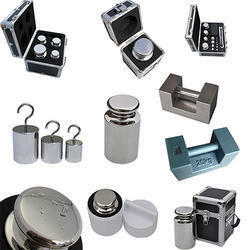 The makeup of these weight sets varies and are used for general and educational use. Incorporated with a wide variety of features & specifications, we are offering our clients a quality assured the range of Stainless Steel Knob Weights. The offered range has been fabricated by us as per the predefined standardization and is availed to the customers at the most comprehensive prices. 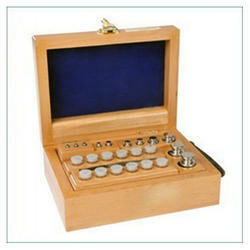 Used in adjustment, testing and calibration instruments for scales of class II.